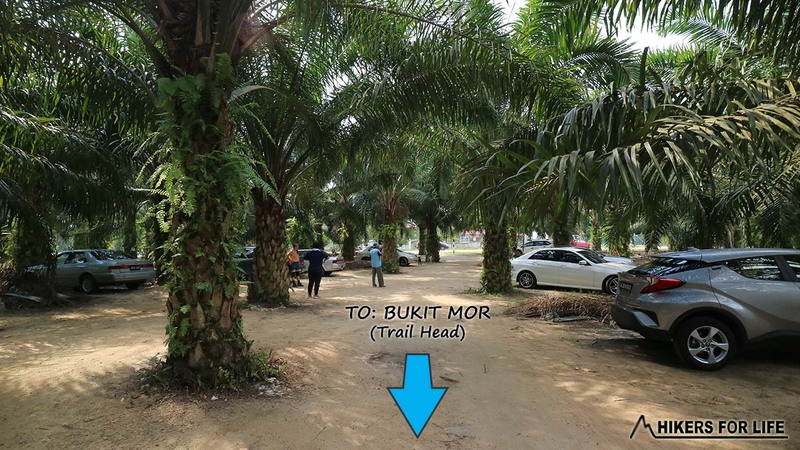 The Bukit Mor hike is a short hike close to Parit Jawa and 13 km south-east from Muar, a town located in the southern-most Malaysian state of Johor. It will take you over an hour to complete this trek at a moderate pace, and the hike rewards you with a beautiful viewpoint overlooking a lake and nature. While the views from the hike are picturesque, there are a few safety considerations to be aware of. As the trail is not properly marked with many diversions, it may be confusing for first time hikers. Be cautious on this hike. Safety considerations are further discussed below. The exact location of the trail head is at GPS coordinates: 1.98244, 102.66986 (Google Maps). 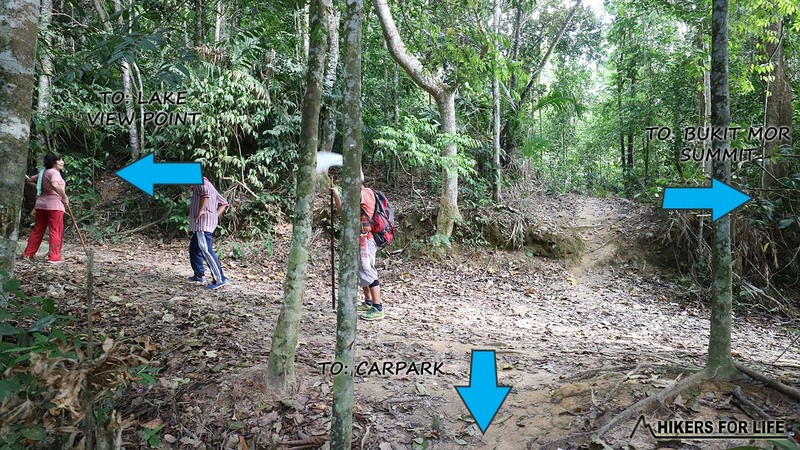 Parking is located within the palm tree plantation area close to the trail head. Do note that there are no toilet facilities at the parking area. If you are driving, the easiest way to find the trailhead would be to input the GPS coordinates into Waze/Google Maps and follow the guidance from the app. However, here is a brief overview of the directions to the trail head from different locations. Find your way out of the town centre to Route 24. Head east along Route 24/Jalan Muar and then, turn right onto Jalan Sri Tanjung. Drive along Jalan Sri Tanjung for 9.4 km until Jalan Parit Jawa – Air Manis / Bakri/J131. Turn left, drive for 1.7 km and you will arrive at the trailhead. To drive to Bukit Mor from Malacca, drive for an hour along Lebuh AMJ/Route 19 and Route 5 to Jalan Dato Haji Kosai in Kampung Parit Keroma Darat, Muar. Stay to the left on Jalan Dato Haji Kosai, turn left onto Jalan Parit Bakar Darat and finally turn right into Jalan Sri Tanjung. From there, turn left onto Jalan Parit Jawa and go straight for 1.7 km until the trailhead. If you are coming from areas further away, it may be easiest to take the North-South Highway all the way until Exit 238. From the exit, follow Jln Muar-Labis/J32 to Jln Naib Kadir/J190 in Taman Bukit Pasir, Bukit Pasir for 15 minutes. Then, take the J190 to Jln Jeram – Sungai Terap/J135. From there, turn left onto Jalan Muar/Route 24 to join the route from Muar. Then, just drive along Jalan Sri Tanjung before turning left at Jalan Parit Jawa. 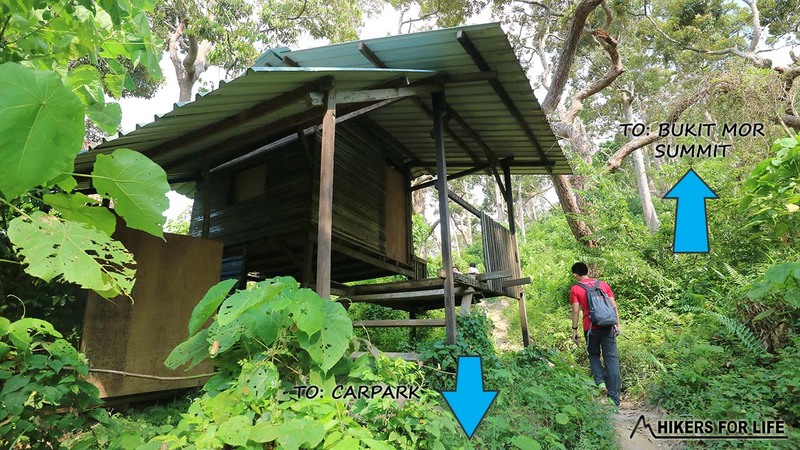 Unfortunately, at the time of writing (March 2019), there are no public transport options that allow you to get to the trail head. 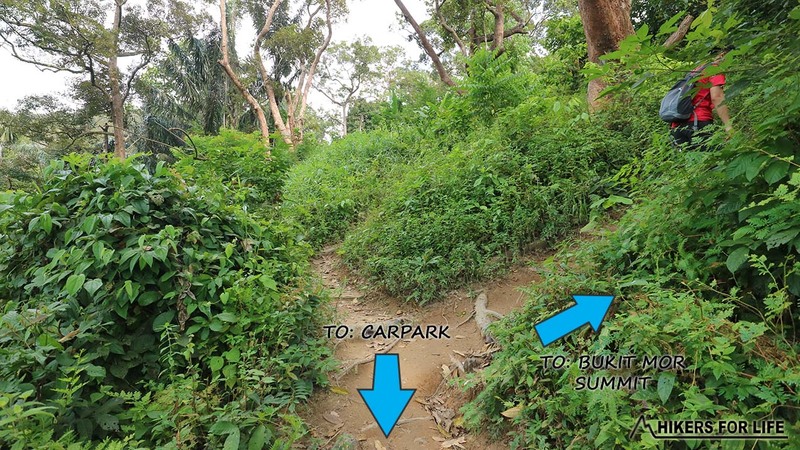 Within Bukit Mor, they are many trail which leads to the same place. The trail we recommend below is a 4.7km loop hike in an anti clockwise direction. The trail first brings us up to the highest point of Bukit Mor and then to the beautiful view point, before coming down from the other side. The first part of the hike is straight uphill. You will reach the summit early, after just 1.5 km of hiking uphill. The remainder 4 km is no less enjoyable as the rest of the hike is a more gradual downhill walk peppered with places of interest and look out points. Follow the trail from the starting point. Shortly after beginning the hike, the trail splits into left and right. Take the right split (Point B). You will then walk past a house on your left (Point C) and come to a Y junction (Point D). Take right again and keep walking straight uphill until the next Y junction (Point E) quite close to the summit. Choose the path on the right and you will come to a cross junction (Point F). From this cross junction, turn right to reach the summit, turn left to continue to the viewpoint. The path going straight is unknown. Point G is the summit with a small lookout point to enjoy the views and take a break after all that uphill hiking. After enjoying the summit, head back to the cross junction/Point F and take the trail to the viewpoint. You will pass a laminated sign Entrance to SS1 (Point H) and then come to a T junction (Point I). Take the trail on the right until you come to a Y junction (Point J). Keep left to keep going downhill past a steep down slope (Point K). You will then come to another Y junction (Point L), take left and follow the trail into an open area (Point M). Take left again and keep walking until you reach Point N, a place of worship signified by a yellow umbrella. Next, walk past the brick shelter (Point O) to the second open area on this hike (Point P). Take the right turn from the open area before turning left at Point Q to climb up a small slope to come to Viewpoint 1 (Point R). Keep walking along the trail to Viewpoint 2 (Point S) to enjoy views of the lake. After the viewpoints, backtrack to Point P, and follow the trail down pass the open area to come to Point T, another Y junction. Turn left and walk downhill to the next Y junction (Point U). Be careful to take the right turn at this point, as the left leads back to the previous trail. Walk downhill pass some rocks (Point V), take right at the next Y junction (Point W) and you will come to some big rocks at Point X. You are now very close to the trail head. Just keep following the trail downhill pass the house to finish your hike. Great news, this hike is completely free! There are no fees required for permits and parking is also free. The closest health care facility to the hike is Klinik Kesihatan Bukit Mor, only 1.2 km away from the trailhead. This is a government run clinic that provides basic healthcare. 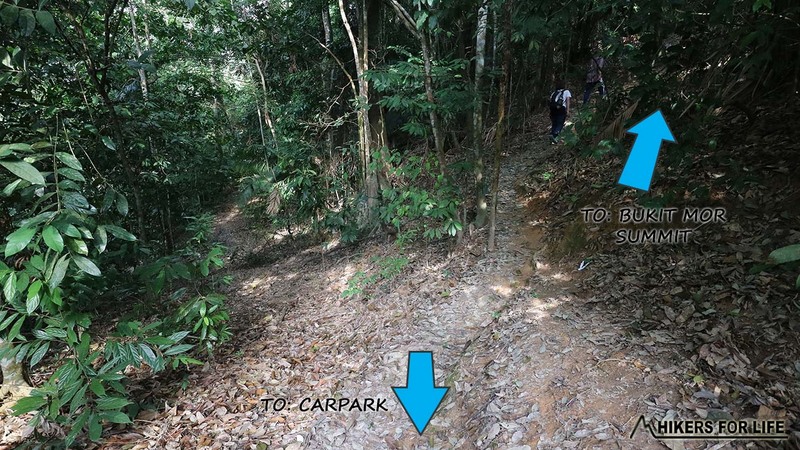 There are many trails in Bukit Mor which are interlinked and these different trails all lead you to different parts of the forest. Due to the lack of signboards and trail markers, it is not difficult to find yourself disorientated and lost in the forest. Due to the potentially confusing and unmarked trails, avoid hiking alone initially. 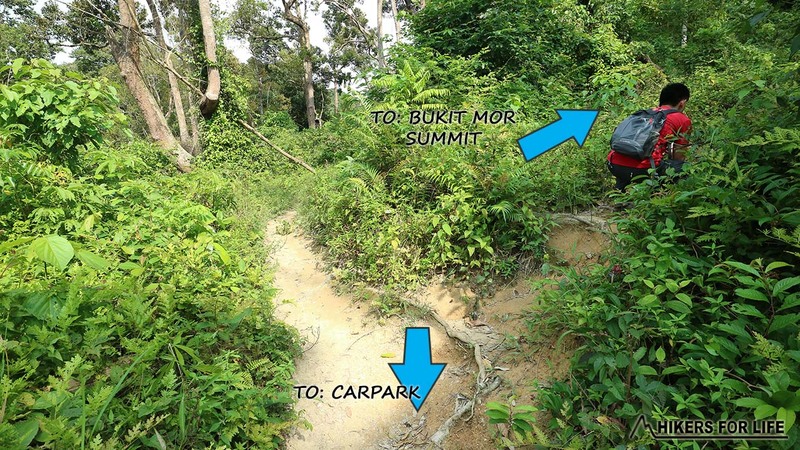 If you are unfamiliar with Bukit Mor, try to hike with people who already know the trail. As always, bring a torch if you are hiking in the evening as the trails get dark early. Recently, there have been sightings of a 10 foot long King Cobra. Seasoned hikers walking the trail in January 2018 came across the poisonous snake among some weeds close to a gazebo. They reported that the snake was hissing and defensive! This is definitely something to look out for when hiking the trail. Read more about it here. 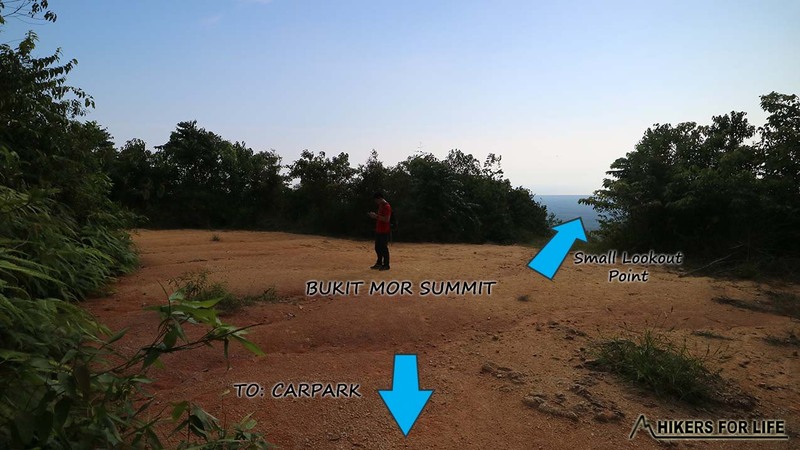 On Bukit Mor, the views are great and the hike is pleasant, if challenging in parts. Just remember to be careful when hiking here and stay focused on the route to have an enjoyable and safe hike.